Can One Spouse Claim the Other as a Dependent? Can I Claim My Spouse as a Dependent on My Tax Return? It only seems fair that your spouse should qualify as your dependent if you're the family's sole breadwinner, but the IRS doesn't see it that way. As with many tax issues lately, there used to be a loophole, but it's been removed—at least temporarily—by the Tax Cuts and Jobs Act (TCJA). 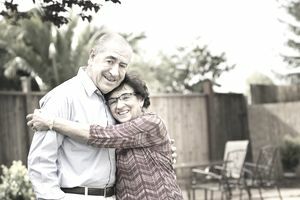 You won't be able to claim your spouse as a dependent under any circumstances until at least 2026, and maybe longer—unless you want to go back and amend a previous year's return, or if you haven't yet filed a return for 2017 for some reason. "Your spouse is never considered your dependent," the IRS says in Publication 501. That's pretty black and white, but there's a fine-line distinction here because the statement is something of a technicality. In tax terms, a "dependent" meets the criteria of being either a qualifying child or a qualifying relative of the taxpayer, and the taxpayer is then entitled to claim that individual's personal exemption on his tax return to reduce his taxable income. And that's the loophole: Even though you can't actually claim your spouse as a dependent, you used to be able to claim her personal exemption under some circumstances before the TCJA took effect. And the end result was largely the same, although this wouldn't qualify you for tax credits that hinge upon having a dependent. You report your combined incomes on the same tax return when you and your spouse file a joint return. You could then claim two personal exemptions through 2017—one for each spouse. This would be the case even if only one of you earned income. But filing a joint return requires the mutual consent and signatures of both spouses, and there might be circumstances under which spouses are unable or unwilling to file jointly. For example, a spouse might be incapacitated and unable to give her consent and sign the return. Or perhaps the tax impact is more advantageous when spouses file separate returns. Your spouse has zero gross income for the year. Your spouse is not the dependent of another person, regardless of whether the other person actually claims her. Filing a separate return means you're using the married filing separate status or the head of the household status because you meet the IRS criteria for being "considered unmarried" on the last day of the tax year. For head of household purposes, being considered unmarried does not necessarily mean that you have a divorce decree. It means that your spouse did not live in your home at any point during the last six months of the year. Some other rules apply as well, such as that you paid for more than half your household's expenses for the year and you have a dependent—and no, your spouse doesn't count. Here's an example: Your spouse had zero gross income in 2018 because she was away at graduate school and she did not work all year, nor did she have any income-bearing investments. If she didn't file her own tax return for that year and if she couldn't be claimed as a dependent by any other person, then and only then could you claim her personal exemption. You'd have to file a separate married return or as head of household to do so, and she must have moved onto campus before June 30 and must not ever intend to return to qualify you as head of household. It must be her intention to remain living apart from you indefinitely. You additionally paid for more than half your residence's expenses and you have another dependent. Your spouse must have zero gross income for U.S. tax purposes. If you file a joint tax return, indicate your name and your spouse's name at the top of the 2017 return. You would then mark that you are married and filing jointly. This entitles you to check the "Yourself" and "Spouse" boxes in the exemptions section of returns for tax years 2017 and earlier. Personal exemption boxes have been eliminated from the new 2018 Form 1040. "To claim the exemption for your spouse, check the box on line 6b of Form 1040 or Form 1040A and enter the name of your spouse in the space to the right of the box. Enter the SSN or ITIN of your spouse in the space provided at the top of Form 1040 or Form 1040A." The personal exemption acts just the same as claiming your spouse as a dependent in any of these situations because it reduces your taxable income by the amount of each exemption. But you won't have this option on the 2018 tax return. The TCJA eliminated personal exemptions for tax years 2018 through 2025, but they might come back in tax year 2026 if Congress renews the Act. Meanwhile, you can still make use of this personal exemption loophole if you go back and amend your 2017 return. You generally have three years to file Form 1040X, the amended return, beginning with the date you filed your original return. If you paid any taxes due on the tax return, you have two years from the date you did so. Your deadline is whichever date is later.